It is all my friend’s fault. All she has been talking about is cheesecake and cheesecake recipes. 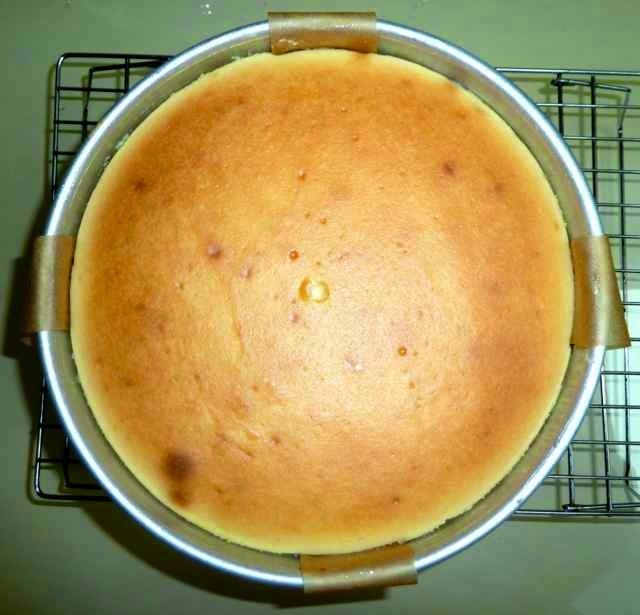 Her husband loves cheesecake and she has been trying to recreate his idea of a perfect cheesecake for a few months. Her husband is now hiking the Appalachian Trail. So far he has walked all the way from Georgia to Pennsylvania. Along the trail my friend will drive to meet him and bring homemade cheesecake. 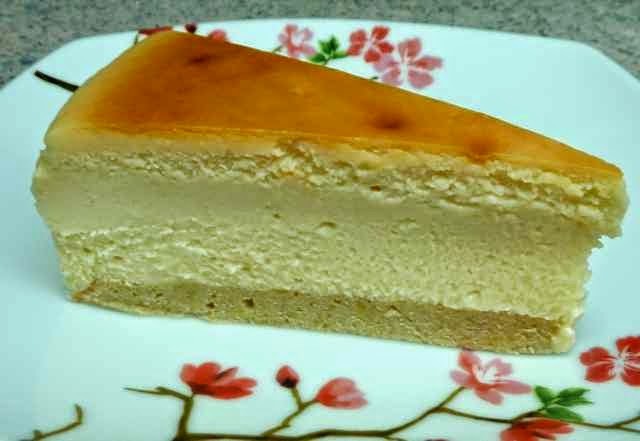 Now I have caught the cheesecake fever and have begun experimenting with cheesecake recipes to get that perfect cheesecake from my childhood memories. There are so many types of cheesecake. Some are dense, some light, some dry, some wet, some creamy, some chocolate, some pumpkin, some with fruit on top. Everyone has their own idea of what the best one is. I grew up in New York City and NYC is famous for its dense creamy cheesecakes. Some say the one from the Carnegie Deli is the best. I used to love Lindy’s. My wife is from Brooklyn where Junior’s is famous and this is her favorite. I decided to start my experiment with a Junior’s clone recipe. What sets Junior’s cheesecake apart is its spongecake bottom. Most other cheesecakes have a cookie crumb or cookie crust of some sort. Junior’s sponge cake on the bottom is controversial. You either love it or not so much. I love how the cheese part of the cake came out. The cake layer on the bottom ‘not so much’. It could be this particular recipe for the cake, but I think cake crust is just not my cup of tea. The creamy, but slightly dense texture and the taste of the cheese part of the cake was perfect and amazing. Everyone loved it. Many commented that it was the best they ever had, but there were some thumbs down on the cake crust. Very good, but not quite the cheesecake I remembered from my youth. If I make this again I will use a graham cracker crust. Soon I will continue my explorations and try another recipe. Maybe the Lindy’s copycat recipe will be next. Preheat the oven to 350°. Lightly grease a 9” round springform pan or pan with a removable bottom. The pan must be at least 2¾” deep or do not make this recipe. I did not have a pan with a removable bottom that was deep enough. I decided to improvise with a regular 3” deep round cake pan. I put two strips of parchment paper cross wise in the pan. I then put a cardboard cake round into the pan on top of the strips. This will allow the cake to be lifted out on the cake cardboard using the parchment paper strips to lift it. After running a knife around the chilled cake the cake came out perfectly. No need to buy a special pan. You could also bake the cake on top of a cake cardboard or parchment round to make it easier to transfer the cake to a plate. 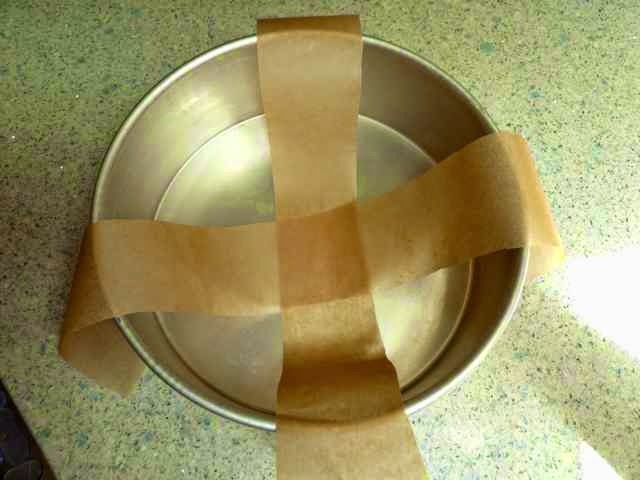 Parchment paper strips across the bottom of the pan. This pan does not have a removable bottom. 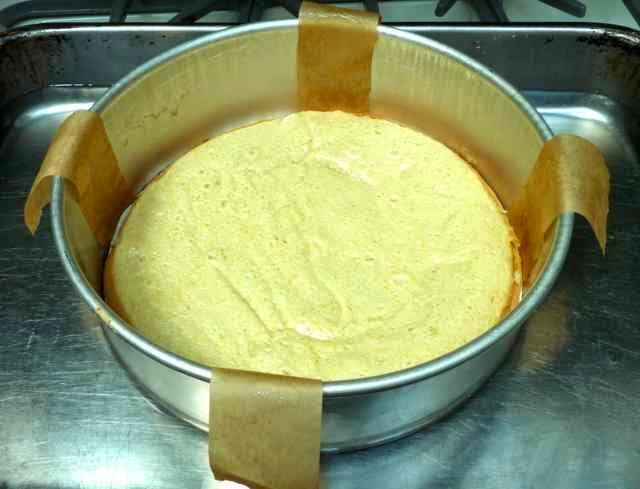 Cake cardboard cut to fit and placed over the strips of parchment paper. lifted out of the pan after it is well chilled. If using a pan with a removable bottom it is necessary to wrap the bottom of the pan with a single large piece of aluminum foil to keep water from leaking into the cake while it bakes in a pan of hot water or Bain-marie. Add the flours, baking powder, sea salt, xanthan gum and 2 Tbs. sugar to a large bowl and mix well. Add the melted butter or oil, vanilla and the 3 egg yolks and mix until well combined. In a separate bowl beat the 3 egg whites and cream of tarter until frothy. Add 4 Tbs. of sugar and beat until stiff and glossy. Egg white mixture beaten until stiff and glossy. Gently mix in ⅓ of the egg white mixture into the yolk mixture. 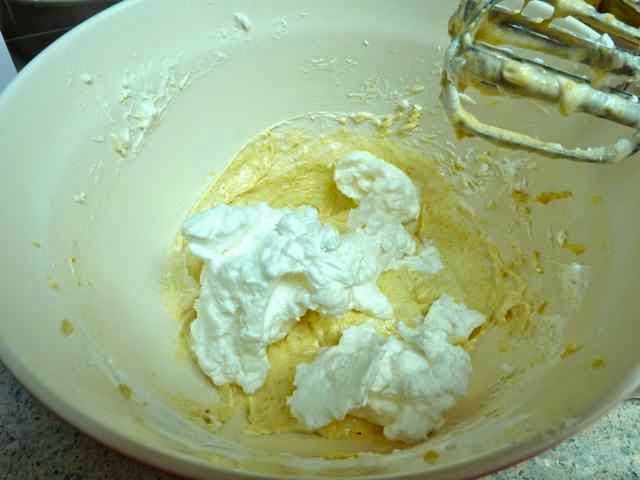 Fold in another ⅓ of the egg white mixture and repeat with the remaining egg white mixture. Second third of the egg white mixture before being folded in. Pour the batter into the prepared pan. 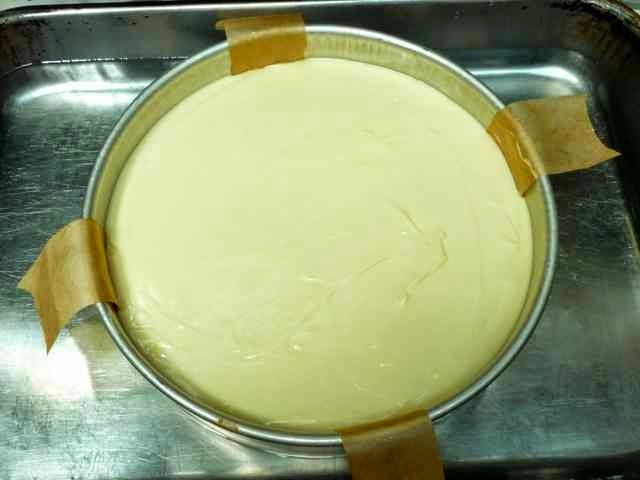 Bake for about 15 minutes, or until the cake has risen, is barely starting to brown, bounces back when pressed lightly with a finger or a cake tester or toothpick comes out clean. 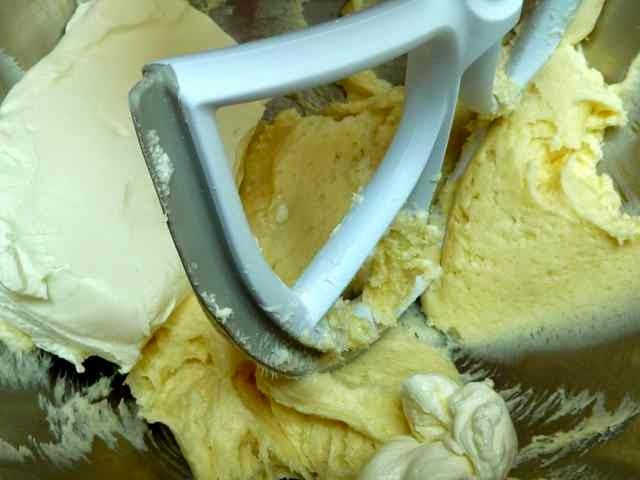 Cake crust batter in the pan. Remove from the oven, and keep the oven on. Run a knife around the edges to loosen the cake and allow the cake to cool completely on a rack while you make the filling. The edges will shrink away from the sides of pan a little bit, this is OK. Baked cake crust in pan. as soon as it was taken out of the oven. Mix 1 package of cream cheese (8 oz. 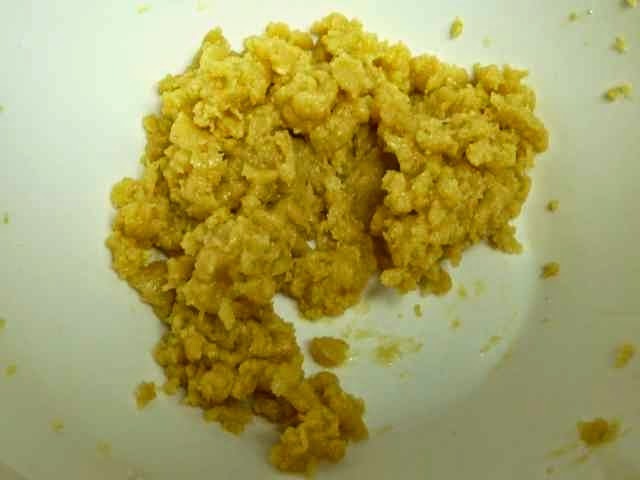 ), ⅓ cup of sugar and the cornstarch in a bowl and mix on low speed until smooth. Add the rest of the cream cheese, 8 oz. at a time, beating after each addition until smooth. Beating cream cheese into the egg and cornstarch batter. With the mixer running on low gradually add 1 cup of sugar and 1 Tbs. of vanilla and mix until well combined. Add the eggs on low speed one at a time, beating in after each addition. 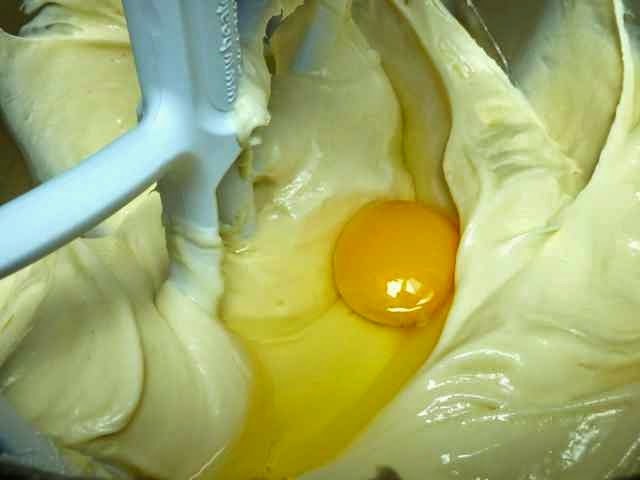 Adding eggs, one at a time to the batter. Still on low speed, mix in the heavy cream. Pour the batter into to pan over the cake crust. Smooth the top with a spatula. The filling will rise so be sure not to fill it to the top of the pan. Place the pan, (with the bottom wrapped in foil if the pan has a removable bottom), into a pan filled with enough hot water to go 1” up the side of the cake pan. Cake pan in a pan of hot water. 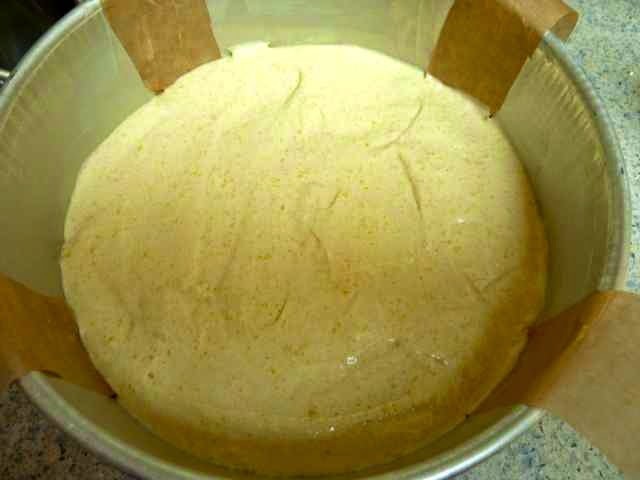 Cheese batter on top of the baked cake crust, ready to bake. Place the cake in the pan of hot water into the oven on the lower middle rack. Bake 75-90 minutes, depending upon your oven. When done the cake will be turning golden on the edges. The center will be jiggly, but the top will appear set. A thermometer in the center of the cake will read 160°-165°. My cake took 105 minutes to bake. When I checked the cake at 45 minutes I was surprised that the top was already brown. I covered the cake with foil during the last 45 minutes of baking to prevent excessive browning. When done, remove the pans from the oven. Lift the cheesecake out of the water bath and onto a rack. I ran a knife around the edge as soon as I took it out of the water to prevent cracking and sinking. in the center is from testing the temperature with a thermometer. Let the cake cool 2-3 hours at room temperature until it is no longer warm to the touch. Refrigerate the cake for several hours before serving. The cake is best when well chilled and set. When ready to eat remove the cake from the pan and place on a cake plate. To serve, dip a knife into hot water then wipe it dry. Dip and dry the knife before every knife cut to get clean cuts and a neat top on each slice. Traditionally this cake is served plain, but you can serve it with fruit or fruit topping if you like. Refrigerate any leftovers if you will eat them within a few days. You can freeze the whole cake or leftover slices, well wrapped. Thaw the whole cake overnight in the fridge before serving. 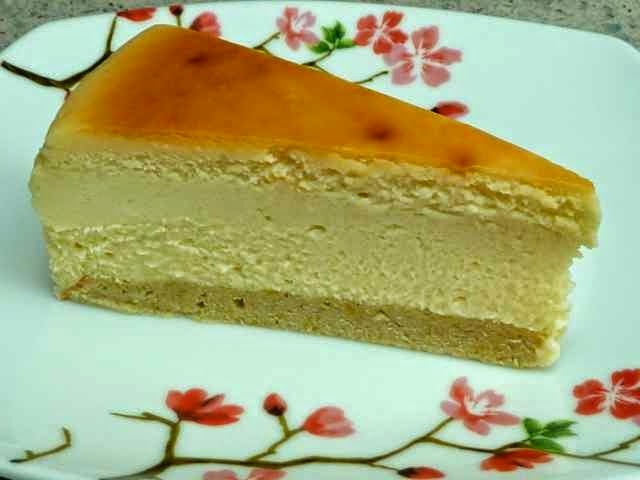 Thaw slices in the fridge overnight or at room temperature for 30-40 minutes.
. GLUTEN FREE ‘JUNIOR’S’ CHEESECAKE Makes one 9” cake Ingredients CRUST 1/4 cup Sorghum Flour 3 Tbs. Tapioca Flour 1 Tbs. Chickpea Flour 1/2 tsp. Xanthan Gum 3/4 tsp. Baking Powder 1/4 tsp. Sea Salt 3 Tbs. Melted Unsalted Butter or Oil (Olive or Canola) 3 large Eggs - Separated 1/4 tsp. Cream of Tarter 1 tsp. Vanilla Extract FILLING 2 lbs./four 8oz. packages Full Fat Cream Cheese - room temperature 1⅓ cups Sugar 1/4 cup Corn Starch 1 Tbs. Vanilla Extract 2 large Eggs 3/4 cup Heavy Cream Directions Preheat the oven to 350°. Lightly grease a 9” round springform pan or pan with a removable bottom. The pan must be at least 2¾” deep or do not make this recipe. I did not have a pan with a removable bottom that was deep enough. I decided to improvise with a regular 3” deep round cake pan. I put two strips of parchment paper cross wise in the pan. I then put a cardboard cake round into the pan on top of the strips. This will allow the cake to be lifted out on the cake cardboard using the parchment paper strips to lift it. After running a knife around the chilled cake the cake came out perfectly. No need to buy a special pan. 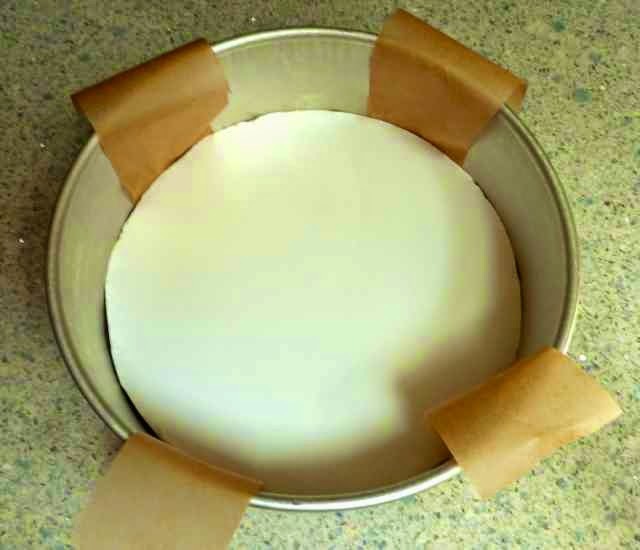 You could also bake the cake on top of a cake cardboard or parchment round to make it easier to transfer the cake to a plate. If using a pan with a removable bottom it is necessary to wrap the bottom of the pan with a single large piece of aluminum foil to keep water from leaking into the cake while it bakes in a pan of hot water or Bain-marie. First Make the Crust: Add the flours, baking powder, sea salt, xanthan gum and 2 Tbs. sugar to a large bowl and mix well. Add the melted butter or oil, vanilla and the 3 egg yolks and mix until well combined. In a separate bowl beat the 3 egg whites and cream of tarter until frothy. Add 4 Tbs. of sugar and beat until stiff and glossy. Gently mix in ⅓ of the egg white mixture into the yolk mixture. 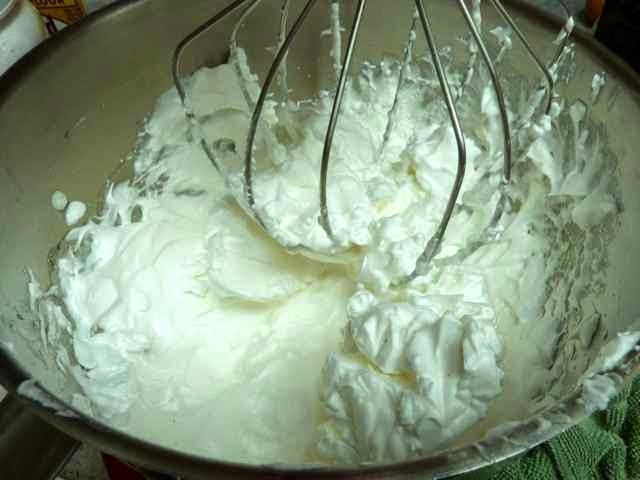 Fold in another ⅓ of the egg white mixture and repeat with the remaining egg white mixture. Pour the batter into the prepared pan. 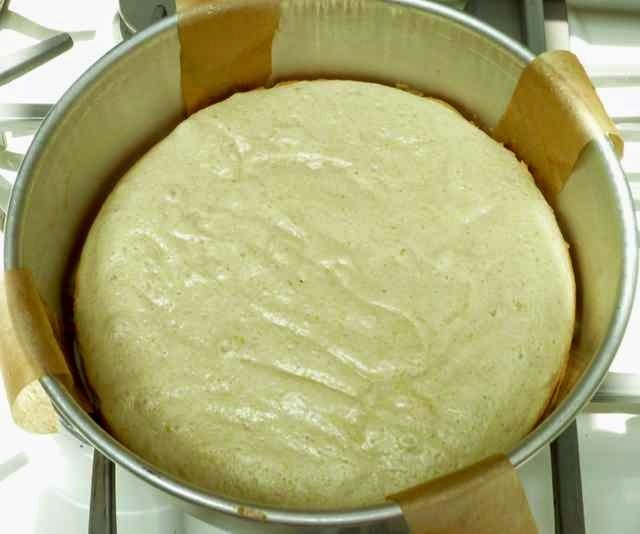 Bake for about 15 minutes, or until the cake has risen, is barely starting to brown, bounces back when pressed lightly with a finger or a cake tester or toothpick comes out clean. Remove from the oven, and keep the oven on. Run a knife around the edges to loosen the cake and allow the cake to cool completely on a rack while you make the filling. The edges will shrink away from the sides of pan a little bit, this is OK. Next Make the Filling: Mix 1 package of cream cheese (8 oz. ), ⅓ cup of sugar and the cornstarch in a bowl and mix on low speed until smooth. Add the rest of the cream cheese, 8 oz. at a time, beating after each addition until smooth. With the mixer running on low gradually add 1 cup of sugar and 1 Tbs. of vanilla and mix until well combined. Add the eggs on low speed one at a time, beating in after each addition. Still on low speed, mix in the heavy cream. Pour the batter into to pan over the cake crust. Smooth the top with a spatula. The filling will rise so be sure not to fill it to the top of the pan. Place the pan, (with the bottom wrapped in foil if the pan has a removable bottom), into a pan filled with enough hot water to go 1” up the side of the cake pan. Place the cake in the pan of hot water into the oven on the lower middle rack. Bake 75-90 minutes, depending upon your oven. When done the cake will be turning golden on the edges. The center will be jiggly, but the top will appear set. A thermometer in the center of the cake will read 160°-165°. My cake took 105 minutes to bake. When I checked the cake at 45 minutes I was surprised that the top was already brown. I covered the cake with foil during the last 45 minutes of baking to prevent excessive browning. When done, remove the pans from the oven. Lift the cheesecake out of the water bath and onto a rack. I ran a knife around the edge as soon as I took it out of the water to prevent cracking and sinking. Let the cake cool 2-3 hours at room temperature until it is no longer warm to the touch. Refrigerate the cake for several hours before serving. The cake is best when well chilled and set. When ready to eat remove the cake from the pan and place on a cake plate. To serve, dip a knife into hot water then wipe it dry. Dip and dry the knife before every knife cut to get clean cuts and a neat top on each slice. Traditionally this cake is served plain, but you can serve it with fruit or fruit topping if you like. Refrigerate any leftovers if you will eat them within a few days. You can freeze the whole cake or leftover slices, well wrapped. Thaw the whole cake overnight in the fridge before serving. Thaw slices in the fridge overnight or at room temperature for 30-40 minutes.